So I'll just put it out there in the great big world. 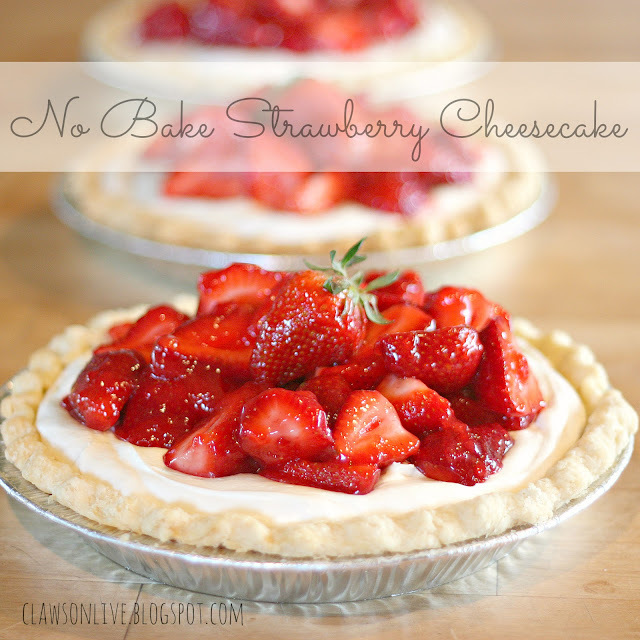 I really really really like No Bake Cheesecakes. I like them better than the baked kind. I probably shouldn't. It's not very sophisticated, or gourmet, or refined. It's just FLUFF! Pure, luscious, simple, fluffiness in all its 3 ingredient simpleness. And to be strictly honest, and transparent...........everyone who eats it loves it too. You will never get more yummy sounds coming out of peoples mouths than when they eat a No Bake Cheesecake! My mom would make them on very special occasions. We knew it was a special occasion BECAUSE we had this Cheesecake. I didn't even know there was a baked Cheesecake version until I was probably in my late teens, and really it took awhile before I liked it. by my very own MOM! 1 8 oz. block of cream cheese at room temp. Place the cream cheese in mixer and mix until mostly smooth. Scrape down the sides and add the sweetened condensed milk. Mix until thoroughly combined and smooth and delicious looking. Fold in cream or Coolwhip and pour into prepared pie shell. I used a regular baked pie crust, but a graham cracker crust or shortbread crust would work well. Top with your favorite fruit of choice. I used fresh strawberries lightly glazed. For the Strawberry Pie you need to blind bake the crust. That's just prebaking. I usually roll out the crust and crimp the edges and then put another pie pan on top of the crust to bake. That keeps the dough from slipping down the pie pan. Bake at 375 for about 15-20 mins. or until browned. Combine all ingredients and cook until mixture comes to a boil. Cool and add to fresh berries for a beautiful glaze. I used about 1 1/2 lbs. of strawberries for each pie. I like the berries whole or just cut in half. I don't add a ton of the glaze. Just enough to cover all the berries and then pile them as high as you can on top of the cream filling. You need to eat the pie the same day. It looks terrible the next day, but it tastes divine still. Well Nicki I think I love your guts now!!! !Thanks so much for the comment and happy thoughts!! My son Jed just got his call to the Adriatic South mission and will be headed to the MTC on July 3rd. He will travel to Albania on Sept. 17. Will your sister still be there or will she be home? We are so excited for the big adventure!! Well my aunt Jone is the best!! I'll have to tell her thanks for sending me blog friends. Isn't she a hoot?! Well I hope you like this cheesecake. It's the fluffy, soft kind that you can eat and eat and eat. The baked cheesecake is the kind you usually get in a restaurant. The New York version. It's a little tricky to make, and tempermental. You'll love this fluffy goodness, and it really is so stinking easy. I can't wait to hear more about your sister's mission. If she has a blog I'd love to follow. Thanks a ton!!!! I don't think I've made a No Bake Cheesecake since high school as a basketball team fundraiser. But you've never let me down, so I've pinned the recipe and will try it out soon! book in it or something. I think that you just could do with some % to power the message house a bit, however other than that, that is excellent blog. A fantastic read. I'll certainly be back. Am I missing something? I made this last night for a friend that was leaving the hospital. It never set. Not in the fridge or the freezer. Big old gooey mess. Quite embarrassing. Is there something I could have missed? Casey!!! Dang!! I hate it when you spend all that time and it doesn't turn out. One thing I can think of is if you microwaved your cream cheese even a little bit it could make your pie sloppy. This is a pretty loose pie though. It isn't as firm as a baked cheesecake, but it should hold it's form when cut. Email me if this wasn't your problem, and we'll see what we can do to make it perfect!! I made this and mine didn't set as well!! Followed directions as said, I didn't let anything get room temperature either, but I did use a bowl cream cheese instead of block but I made sure it WAS NOT whipped !!! Help?! My kids really love the taste of this cheesecake !! Dang!!! Obviously there is something up with this recipe. The last comment on this cheesecake said her's didn't set up either. Was the cream cheese you use the Neufachtel variety. The lower fat cream cheese? I'll do a little experimenting and see what I can figure out. Did the pie travel anywhere at all in the car?